Are you concerned about someone else using your WhatsApp Account? 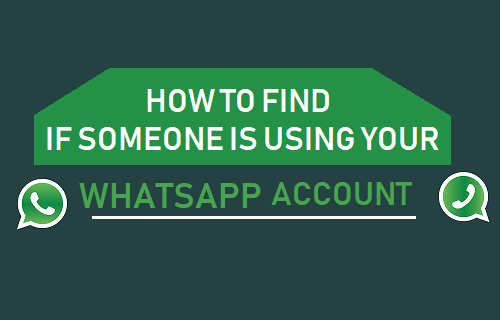 You will find below the steps to find if someone is using your WhatsApp Account. WhatsApp makes use of valid Phone Numbers to verify its users and allows the App only to be used on one mobile device at a time and on a computer or Mac using WhatsApp Web. 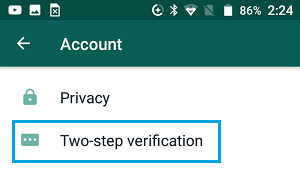 In addition to above, WhatsApp supports end-to-end encryption of messages and provides its users with the option to enable Two-step verification. With above safety features, the chances of someone using your WhatsApp Account can only occur in the following cases. Someone is able to access your phone. You forget to logout from WhatsApp web on a computer or Mac. Your Phone Gets Lost, Misplaced or Stolen. If someone is using your WhatsApp Account, you are likely to see messages that you did not send, accepted friend requests that you did not make and New Groups that you did not join. Carefully go through WhatsApp Messages on your Phone and see if you can find any message that you did not send, any Contact that you do not know and any WhatsApp Group that you did not join. 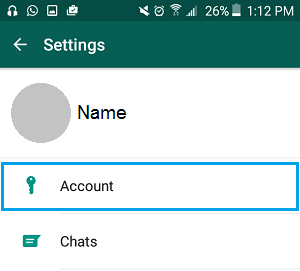 After checking for suspicious messages and Contacts, you can follow the steps below to find someone is using your WhatsApp Account on computer using WhatsApp Web. 1. 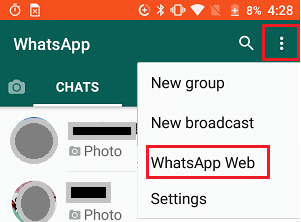 Open WhatsApp on your Android Phone, tap on 3-dots Menu icon > WhatsApp Web. In case of iPhone, tap on Settings tab in bottom menu > WhatsApp Web/Desktop. 2. On the next screen, if the camera opens, it confirms that no active WhatsApp Web session is taking place on your Account. However, if you see a window that lists a logged in computer, it means that an active WhatsApp Web session is taking place on your WhatsApp Account. 3. Tap on Log out from all devices. 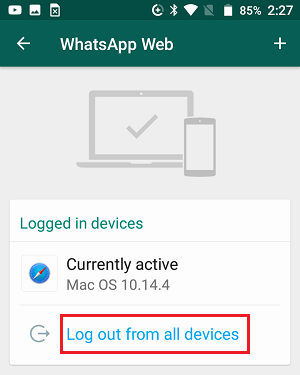 This will make sure that your WhatsApp Account is logged out of all the devices. You can greatly reduce the chances of someone using your WhatsApp Account by Locking WhatsApp on your phone with a passcode. Another way to protect your WhatsApp Account is by enabling Two-factor authentication, which will basically associate a 6 digit PIN with your WhatsApp Account. 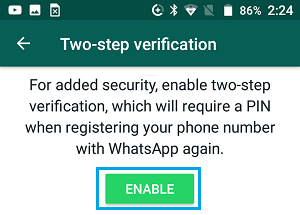 When Two Factor Authentication is enabled, anyone trying to verify WhatsApp using your Phone Number will be required to enter the 6-digit PIN. 1. 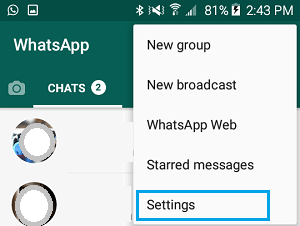 Open WhatsApp and tap on 3-dots menu icon > Settings. In case of iPhone, tap on Settings tab located in the bottom menu. 2. On the Settings screen, tap on the Account option. 3. On the Account screen, tap on Two-step verification. 4. Next, tap Tap On the Enable button. 5. On the next screen, enter a 6-digit PIN and tap on Next. Important: Write down the PIN and make sure you do not lose it. 6. Follow the next onscreen instructions to complete this process. 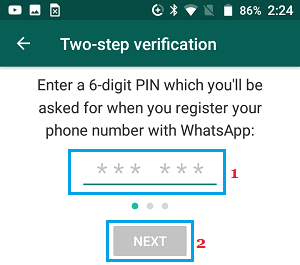 Once the PIN is setup, anyone trying to verify WhatsApp using your Phone Number will be required to enter the 6-digit PIN. Also, WhatsApp will periodically prompt for the verification code during routine use.